Last Friday evening, the 8th of May, nearly 60 of you joined us for the Suburban Wines dinner event of the season. If you were not one of them, we regret that you missed Kent Rosenblum of Rosenblum Cellars graciously presenting to us ten selections from his impressive armada of California wines, including several of his top bottlings, paired nicely with multiple carnivorous courses at Peter Pratt’s Inn. If you were one of the attendees, you may or may not agree with me when I state that his wines are more balanced and sophisticated than they’ve ever been! I’ve been a quiet follower of Rosenblum wines since I tasted a ton of them back in the spring of ’01 with former winemaker Jeff Cohn at one of his storage facilities near Oakland. Back then, I found the wines to be fun, delicious and very Californian, if not assertively-oaky, sweet and high in alcohol. But what I tasted (drank) last Friday proved to me that Kent has been heading in a whole new direction, whether or not he let on about such a paradigm shift. 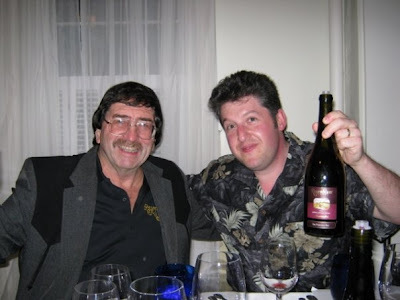 His ‘05 Pickett Road Petite Sirah, for example, exhibited shocking purity and enough restraint to pique the interest of fans of Super Tuscan-style reds or modern-styled Spanish, for instance. There’s no shortage of “guts” in the wine, but the glop factor has been drastically reduced. The same goes for his ’05 Maggie’s Reserve and St Peter’s Church Zindandels, both of which were majestic and absolutely breathtaking to drink.